Pretty blue-and-chrome Royal Enfield Bullet has left its owner singing the blues. "It is too much for me to deal with and needs to be owned by a mechanic or someone who is very in the know about a motorcycle like this." He's obviously sad about it, and the motorcycle must have cost him a pretty penny, too. "I just bought this from California and had it shipped to Fargo," he wrote. 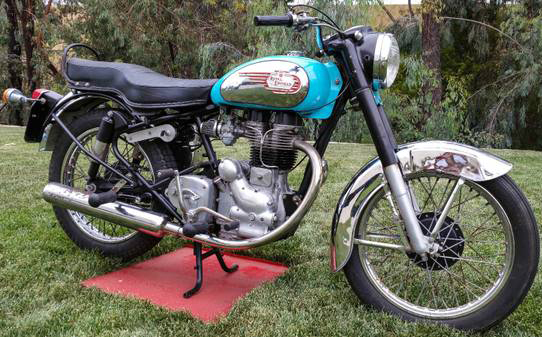 I recognize the cute-as-a-bug blue-and-chrome Royal Enfield Bullet from CraigsList ads that have been running in California for years. The California seller never quite explained why he wanted it gone, but you got the feeling there might have been some heartache there, too. As for the fellow in Fargo, he noted that "It has a special starting procedure and if you don't know what that is then this bike is not for you. Yes it runs. This bike was an Indian market motorcycle; it has a right side shifter." Those aren't insurmountable problems. You can learn the starting procedure; you can get used to shifting with your right foot. Maybe — hopefully — you'd be able to get it registered in your state despite the fact that it was a private import (check with your state before you buy). By themselves, these are not deal breakers for many people. But the fact that it's a rare bird around town and it's not obvious where to find a mechanic who can make it behave (and at what price) could be a bit discouraging. We've all been conditioned to expect things to work the way we want them to work without having to work on them. People who expect right-out-of-the-box iPhone-style results from an old Royal Enfield are bound to be disappointed. "I will only sell this bike to someone who knows about Royal Enfield because I do not know much." Too bad someone familiar with starting the bike isn't close by to give the guy a hand. I'm not surprised. Minnesota is a long way from the ports of entry that RE would be using as they roll out new models. With the amount of money Eicher must be pouring into this venture, you can bet they want to control the flow from the time those products leave the factories until they hit the customers' garage floors. They don't want themselves in the same position the Italian makers were in when Cosmopolitan Motors in New Jersey closed years back, leaving them with no US importer or distributor......ouch!